(blues, soul) - Al Basile, something like 50s counterspy Herb Philbrick, has led three lives: as a singer/songwriter/cornetist in blues and jazz circles; as a poet/playwright/fiction writer; and until a few years ago, as a teacher/coach at an independent school in Rhode Island. 2012 marks a watershed year for him, with the publication of a career retrospective book of poetry, A Lit House, and with the release of his ninth Duke Robillard-produced solo CD At Home Next Door, which is itself both a retrospective of his blues songwriting and performing during his 14 year tenure on his own Sweetspot Records label (which proves that he's always been an elite talent, if not always well-known), and a collection of new songs in a 60s Memphis style (which prove that he's better than ever). He has always enjoyed a unique relationship with his boss from his first band Roomful of Blues, Duke Robillard, who has produced and played on every one of his releases, and he continues to draw from the best blues players from the Northeast, including many Roomful alumni. At Home Next Door also has a guest appearance by his old friend and Providence musical compatriot, jazz great Scott Hamilton, on tenor sax. Al started out as a writer. He was the first to get a master's degree from Brown University's Creative Writing program; he also wrote musicals as an undergraduate. Meeting Duke Robillard in 1969 changed his artistic direction for life. He began his performing career in 1973, hired by Duke as the first trumpet player for Rhode Island's premier jump band Roomful of Blues, and played with such blues and jazz greats as Eddie “Cleanhead” Vinson, Red Prysock, Helen Humes, Joe Turner, and Johnny Shines. Leaving in 1975 to devote himself to teaching, singing, and songwriting, he was reunited with Robillard, Roomful's founder, in the late eighties. In the two decades-plus which have followed, he has written songs with and for Duke which are on ten Duke Robillard CDs, and played on ten as well, including the Grammy nominated Guitar Groove-a-Rama and Stomp! The Blues Tonight. Songs co-written by Al and Duke have been used in films and on television's Homicide:Life on the Streets. Al also had a song of his on the Grammy-nominated Ruth Brown CD R&B=Ruth Brown in 1997, and he appears as a band member in Duke's concert DVD Duke Robillard and Friends Live at the Blackstone River Theater. Al started his record company Sweetspot Records in 1998 while he was still working full time as a teacher, because he had so many songs which sprang from different parts of the American roots landscape that no one artist would identify with them all – except the one who had created them. Over his first eight releases he covered many blues, jazz, and roots styles, and featured guest artists such as lifetime Grammy recipients the Blind Boys of Alabama, Blues harp greats Jerry Portnoy and Sugar Ray Norcia, keyboardist Bruce Katz, sax phenom Sax Gordon, and many Roomful horn mates like Doug James, Carl Querfurth, and Rich Lataille along with Duke and his band. Together they brought every song across Al's broad range of influences to idiomatic life. Al has focused more on reaching the public since leaving teaching, and his last four CDs placed in the top 15 on the Living Blues airplay charts in the months of their release. 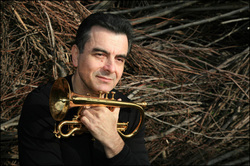 He has been nominated for two Blues Music Awards as best horn player in 2010 and 2012. Al's reviews consistently comment on his strengths as a writer. He uses his lyrics to tell stories with universal appeal, bringing to the task his skills as a published poet but keeping the words strong, simple, and evocative. His ease and strength as a vocal storyteller continues to grow with each release, and his cornet playing is rich, nuanced, and succinct, informed by jazz but instantly communicative as an alternate voice. His songs are all lyrically and melodically deep, and the characters and situations are like compressed theater. While Al kept his various artistic talents alive and growing throughout his 25 year teaching career, he has moved into the public eye quickly since leaving that profession. He's a model for his generation in showing how to have sequential careers, remain independent, and produce work that is both accessible and thought-provoking. His music sounds good – you can put it on while making dinner – but if you have time for a careful listen – the deeper you look, the more you'll find. (Sweetspot Records).